I never think in advance about what one of my Common Elements artworks will look like when I commission it. As I’ve written on other occasions, much of the fun for me is the surprise of seeing how an artist decided to use the characters I assigned. In the case of today’s spotlight piece, however, I did have one thought: How will Dheeraj Verma make NFL SuperPro not look lame? Because NFL SuperPro just might be the lamest superhero in the history of comics. At the very least, he’s in the top three. Sir Alec Issigonis, the man responsible for the British car we know today as the Mini, once said, “A camel looks like a horse that was planned by a committee.” NFL SuperPro looks like a superheroic camel dreamed up by a sports marketing firm. And not a top-shelf sports marketing firm — a midlevel agency trying to get in good with the biggest dog in American professional sports, the National Football League. I don’t know for sure that’s how it went down, but I’m probably not all that far off. Now, I know what you’re thinking. If NFL SuperPro is so completely ridiculous, why are you using him in a Common Elements commission? Because, friend reader, that’s the magic of Common Elements. The element of surprise. Bringing together characters you’d never expect to see in the same frame — perhaps even a character or two that you’d ever expect to see, period. For an example of a professional-athlete-turned-costumed-crusader done right — or at least, less wrong — there’s Wildcat. Although he’s a perennial C-lister, Wildcat holds a place alongside some of the longest-running superheroes in comics. He first appeared in July 1942’s Sensation Comics #1 — the very same issue made famous as the debut of Wonder Woman. If nothing else, Wildcat stands the test of time. When he’s not running around dressed like a ginormous black cat, Ted Grant is a retired heavyweight boxing champion and expert martial artist. (Because if you’re a superhero, and don’t have superhuman abilities, martial arts expertise is de rigeur.) A longtime member of the Justice Society of America — formerly the alternate-Earth version of the Justice League, now more like a mentorship program in which older heroes show younger crimebusters the ropes — Ted has helped train several up-and-comers, most notably the current iteration of Black Canary. At various times, Ted has also shared the Wildcat identity with junior heroes. A young woman named Yolanda Montez became Wildcat for a while in the 1980s. Later, Ted’s long-estranged son Tom Bronson morphs into a werecat (I kid you not) and joins his dad in the JSA, both of them calling themselves Wildcat. Tom eventually opts to be known as “Tomcat” instead, which is both less confusing and more comical at the same time. It’s a good thing that artist Verma chose to depict these two athlete-avengers as fighting on the same side. Should there ever be a battle between Wildcat and NFL SuperPro, Wildcat will kick SuperPro’s hindquarters nine ways from Sunday. Because NFL SuperPro is lame. Categories: Comic Art Friday, Hero of the Day, Sports Bar, SwanStuff, That's Cool! LearnedLeague season 60 (hereafter, LL60) has concluded, with a grand time had by all 1824 trivia mavens who participated. The eight A Rundles — one in each league — form the top level of competition. Before LL60, only four A Rundles existed, with the most lethal being A West — nicknamed “A Murder” for the frighteningly high skill level among its members, many of whom were Jeopardy! all-stars, crossword puzzle superstars, and world-class quiz champions. For the season just concluded, in an effort to spread the best players around a bit more, each of the previous A Rundles was split into two. The former A West morphed into A Central — my new home for LL60 — and A Pacific. As interesting as it is to follow the head-to-head match totals that determine one’s standing within the Rundle, as a trivia purist I’m far more interested in that most basic of statistics: How many questions did I answer correctly? In this case, the answer is not as many as last season. In LL60, I scored 124 (of a possible 150) correct responses, for a batting average of .827. That’s not at all shabby. But in LL59 — the last season of A West — I notched 133 correct, a percentage of .887. This means that, with nine fewer correct answers this season over the previous, I gained 19 places in the standings. It’s worth noting that I had the same correct answer total this season as I did in my first season in A West (LL57). That season, I finished in 8th place. In each of the next two seasons, my level of accuracy went up slightly — I had 125 correct (.833) in LL58, then the previously mentioned 133 (.887) in LL59 — even as I plummeted in the Rundle rankings: 17th in LL58, 26th in LL59. You can see the reason for this by looking at the ever-growing number of correct answers given by my opponents: 115 in LL57, jumping up to 122 in LL58, then a stratospheric 135 in LL59. Over the three seasons, even while my accuracy was getting marginally better, my competitors were consistently getting even better still. Now you see just how freaking difficult it was to play among the monsters in A Murder. Don’t get me wrong — I’m not complaining. A Central is plenty tough just as it is. But I’m under no illusion that my season-to-season record improved in LL60 because I suddenly got a lot smarter. I have the newly diluted competitive environment to thank. It’s certainly not my defense. My defensive efficiency dropped this season to .671, from .692 in LL59. (We’ve already seen how well that latter number worked out for me. Which is to say, not much at all.) I’ve resigned myself to the fact that I will probably always be a mediocre defensive player, given that I have little desire to spend hours poring over my respective opponents’ question histories in an effort to more effectively divine what they may or may not know. Anyway, the bottom line is that I managed to avoid relegation to the B level for yet another season, granting myself at least one more go at the A level. LL61 begins on May 12. It’s often noted — and correctly so — that superhero costumes as depicted on the comic book page rarely work if translated exactly to a live-action medium. Even though some fans howled when director Bryan Singer completely retooled those characters’ iconic outfits for the first X-Men film, it was without question the right choice. Yellow-and-blue spandex just isn’t a good look in live action, while black leather pretty much always looks awesome. In the same way, most of the Marvel Studios-produced films (in contrast to X-Men, which is a Fox property) have tweaked the heroes’ haberdashery in ways that make perfect sense — Thor, Iron Man, and especially Captain America look quite different on camera than in print, but remain instantly recognizable even as they adopt more realistic colors and materials. Seriously, did anyone really need to see a purple-clad Hawkeye sporting a harlequin mask in The Avengers? Didn’t think so. Here’s a more subtle example of that principle. I’ve always been fond of superheroine costume designs that incorporate a skirt. To my eye, a skirt reflects grace and ease of movement. Artist Ben Dunn, best known as the creator of Ninja High School, illustrates that quality to perfection in this drawing of Wonder Woman. But now, try to imagine this costume being worn by a real-life Diana. Every time she flew, she’d be offering a display of her nether regions — or at the very least, her underwear, assuming that Amazons wear underwear — to friend and foe below. Not exactly what “in her satin tights, fighting for our rights” is supposed to imply. That’s a good part of the reason why I’ve always liked Supergirl’s costume from the mid-1970s, seen here in a lovely drawing by Michael Dooney of Teenage Mutant Ninja Turtles fame. Yes, to the 21st century viewer, Kara’s hot pants appear dated. They are, however, practical from both the visual and combat perspectives. She can move in them with complete freedom, while keeping her business out of everyone’s noses, so to speak. 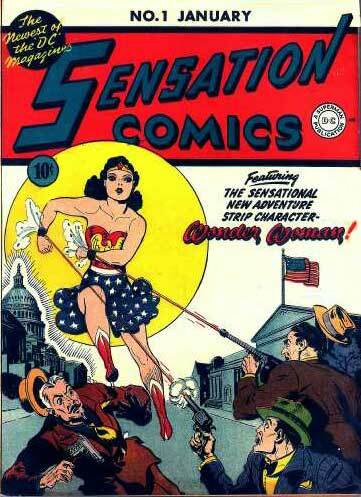 A lot of folks mistakenly believe that Wonder Woman’s original costume, recalled most famously from H. G. Peter’s cover art for Sensation Comics #1, included a star-spangled skirt. It’s hard to tell in this particular drawing, but in fact, the lower half of this costume is a voluminous pair of culottes — what we often call “skorts” in today’s fashion parlance. They combined the visual appeal of a flowing skirt with reduced potential for inadvertent overexposure. Either Peter got tired of drawing the culottes or the All-American Comics editorial staff dictated against them, because a very brief (no pun intended) time later, they evolved into the form-fitting bicycle-style shorts that Wonder Woman wore throughout the remainder of the Golden Age and into the 1950s — also a fine practical option. Aesthetically, though, you’ve got to admit that Diana really rocks a good skirt. Maybe another time we can address the bustier. Here’s a little something that I’ve owned for a couple of years now, but that somehow has never found its way into a Comic Art Friday post before today. It’s Black Canary, one of the most venerable comic book superheroines, as rendered by the perspicacious Aldrin Aw, better known to the comics world by the nom de plume Buzz. (If you think about it for a moment, you’ll figure it out.) I acquired this artwork second-hand via an eBay auction, so even though Buzz annotated it “Baltimore ’06,” you may rest assured that I was nowhere near Baltimore in ’06. Therefore, whatever might have gone down there then, I cannot be held responsible. Black Canary fascinates me, if for no other reason than that she has survived an incredibly long career in comics — she first appeared in Flash Comics #86 in 1947 — without being a particularly interesting or remarkable character. I don’t mean that at all unkindly; as I’ve noted, I’m a fan. It’s just that in any group, someone has to represent the average, the median, the merely competent. When it comes to superheroines, Black Canary falls into that broad central swath. For the past several decades, Black Canary has been romantically linked to Green Arrow, probably because one way to make two rather nondescript characters stronger is to pair them up. (Again, I don’t mean that as an insult. Green Arrow has always been among my favorite DC heroes. But seriously… he’s a guy who shoots arrows.) The two have been coupled — sometimes married, sometimes not — since the early 1970s. Their stormy relationship has proven to be one of comics’ most enduring love stories, and is a significant part of both characters’ charm. Can we talk about fishnet stockings for just a moment? I’ve always thought the Canary’s fishnets just seemed odd and out of place. The leather jacket and boots I understand — she rides a motorcycle, after all. But why would a top-flight expert in hand-to-hand combat opt for pantyhose from Frederick’s of Hollywood? It boggles the mind. Fishnets seem particularly ill-chosen for a character on a bike. You might want to think about some sturdy trousers there, Ms. Lance. Thighs can be delicate equipment. For the record, I don’t much care for the look of stockings — fishnet or otherwise — on women in real life, either. I’m probably in the minority here. It’s a taste thing. Black Canary’s case was even more extreme. A natural brunette, she disguised herself for crimefighting duty not by covering her face, but by putting on a blonde wig. Just imagine if Tina Turner or Dolly Parton had been superheroines. No one would have ever sussed out their identities. Come to think of it, I’m not entirely certain that Tina Turner isn’t a superhero. More thought required. For what it’s worth, I think the current iteration of Black Canary is actually blonde 100% of the time. Or as blonde as most blondes are in American culture, anyway. At any rate, I believe she’s wig-free.